An exhibit looking at the development of railroads in Texas. 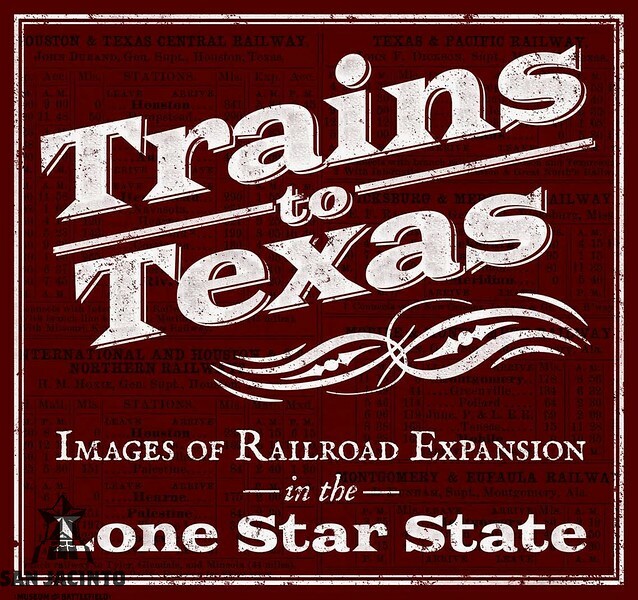 Railroads have played an important role in the growth of Texas. 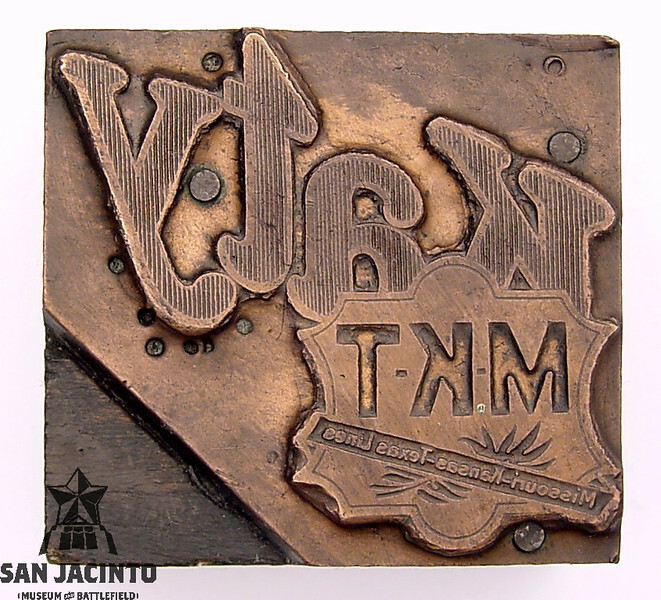 Take a look at some of the artifacts and documents in the San Jacinto Museum of History that illustrate the impact of railroads on Texas history. To enlarge the image, click on it, and then on the stacked rectangular icon in the lower right corner; click the X at the top right to close the enlargement. 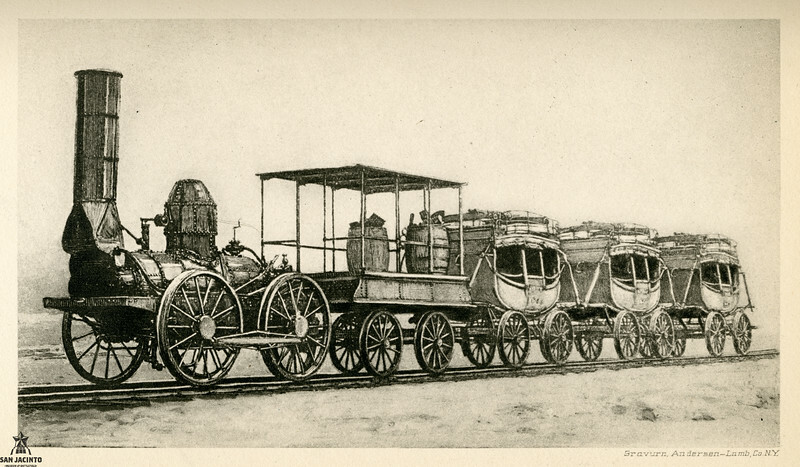 Although man-powered rail transport had been used as early as the 6th century BC, it was not until the 19th century that steam locomotives and iron rails (first made in the 1790s) made railroads practical for transport over distance. Beginning earlier in Great Britain, the first locomotive-powered rail travel in the U.S was in 1830, along the Baltimore and Ohio Railroad. This picture shows the first train on the Mohawk and Hudson Railroad, which connected Albany and Schenectady, New York, a distance of 16 miles; it made its opening trip on September 24, 1831, in 47 minutes. The locomotive was called the DeWitt Clinton, and burned wood to produce steam. In colonial Texas, goods for Stephen F. Austin's town of San Felipe de Austin traveled from Harrisburg near Galveston Bay across land to the Brazos River by wagon. 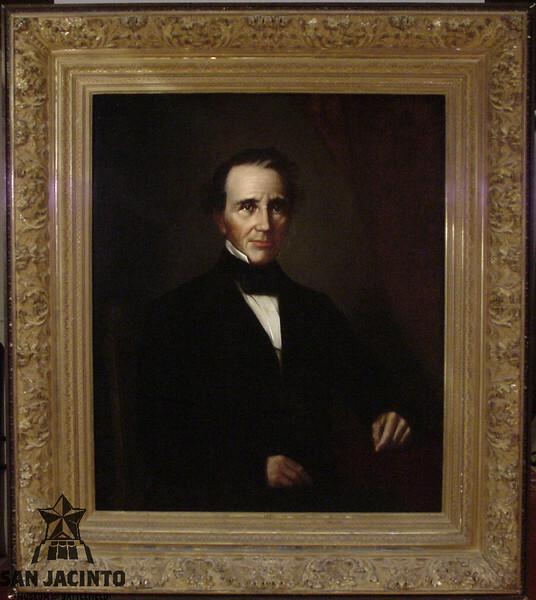 Andrew Briscoe, a veteran of the Battle of San Jacinto, began promoting the construction of a railroad from Harrisburg to the Brazos River in 1839. 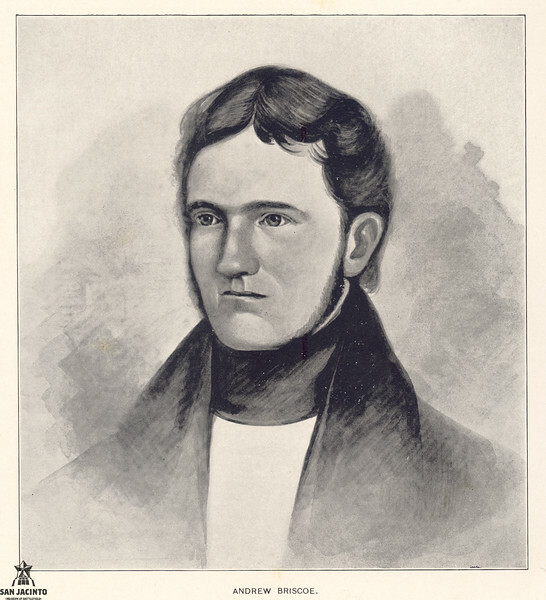 In 1840, Briscoe published a plan for building a railroad from Harrisburg to San Diego, California, by way of Richmond, Prairieville, Austin, and El Paso. 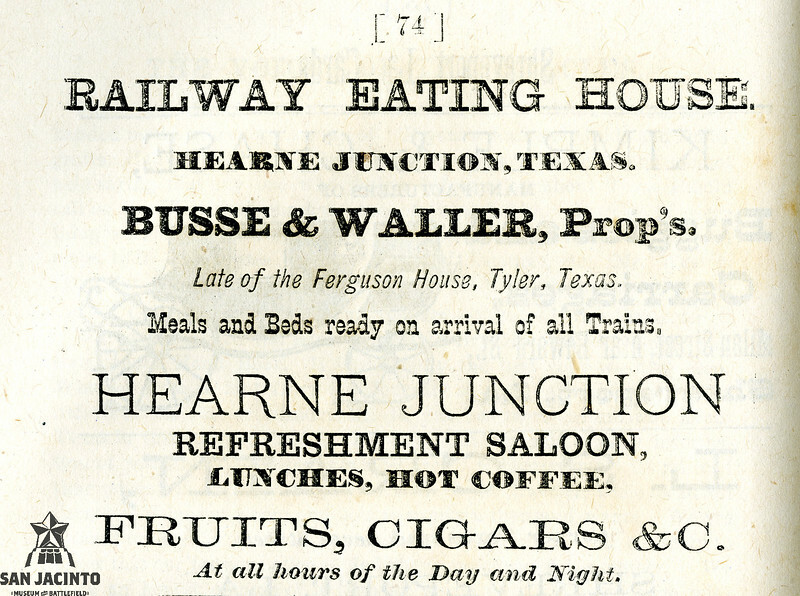 The Harrisburg and Brazos Rail Road was the first railroad in Texas under construction. 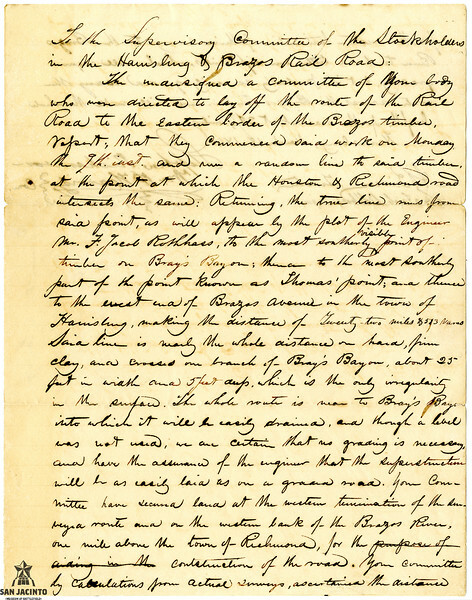 In this letter, Briscoe lays out the route from the timber line of the Brazos River to timber along Bray's Bayou, to Thomas' Point, and then to Harrisburg, a distance of 22 miles. 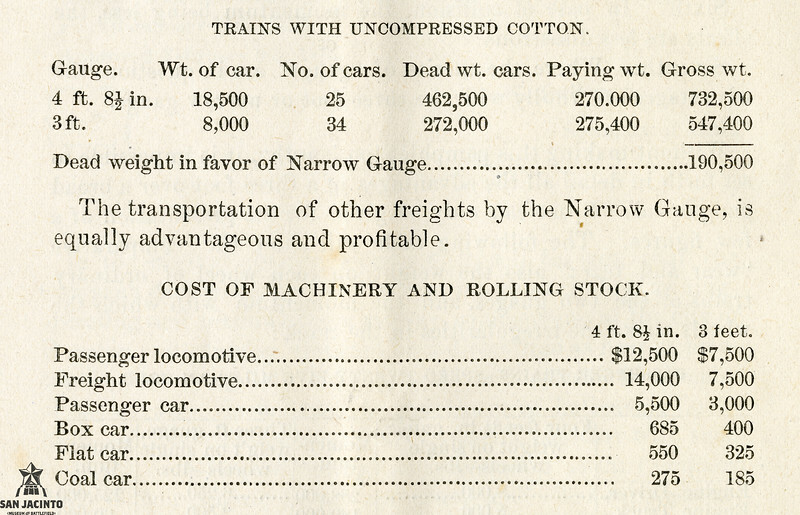 This letter from Andrew Briscoe to the supervisory committee of the Harrisburg and Brazos Rail Road lists the contracted expenses of 3000 railroad ties at 50 cents each, 1000 feet of rails at $70 per thousand feet, the engineer's salary for F. Jacob Rothhaas of $500.00 per month, and two surveyor's chain men at $5 per day for 5 days. 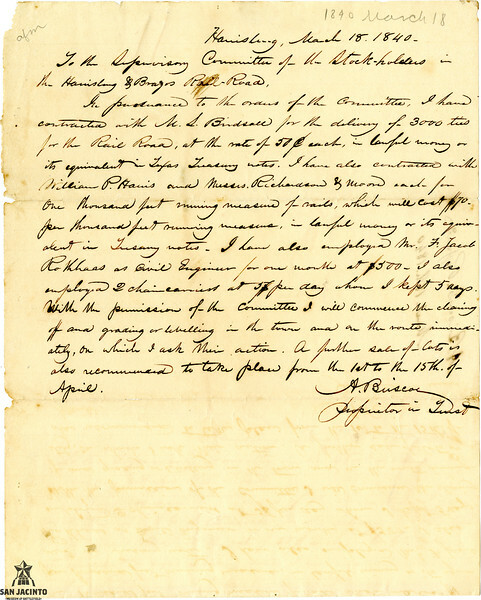 In 1841, the Republic of Texas chartered the Harrisburg Rail Road and Trading Company, with Andrew Briscoe as president, including the assets and debts of the Harrisburg and Brazos Rail Road. 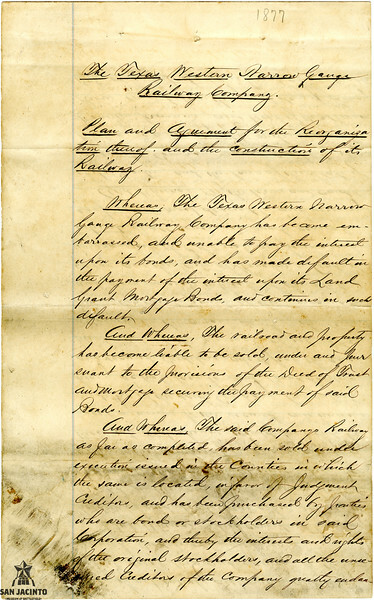 Mergers, reorganizations, and corporate renaming have been common throughout the history of Texas' railroads. Briscoe's Harrisburg and Brazos Rail Road was able to grade two miles, but then failed for lack of capital. 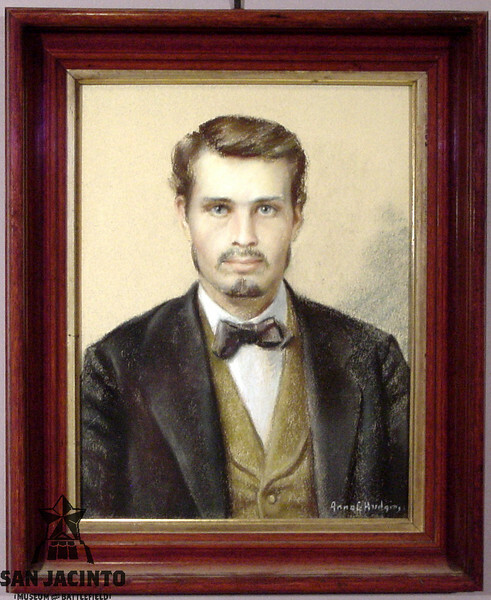 In 1847 Texas veteran Sidney Sherman purchased the Harrisburg town property from Briscoe and his associates, and raised capital to charter the Buffalo Bayou, Brazos and Colorado Railway in 1850. The initial segment from Harrisburg to Stafford, Texas, opened on September 7, 1853 - the first working railroad in Texas, and only the second west of the Mississippi River. The Buffalo Bayou, Brazos and Colorado Railway ran into financial difficulties during the Civil War, and was reorganized into the Galveston, Harrisburg, and San Antonio Railway Company in 1872. 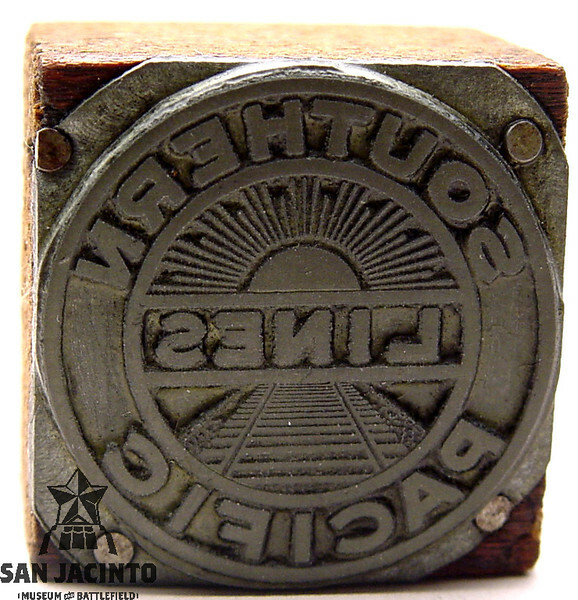 Called the Sunset Line, the route maintained the nickname when it became part of Southern Pacific. 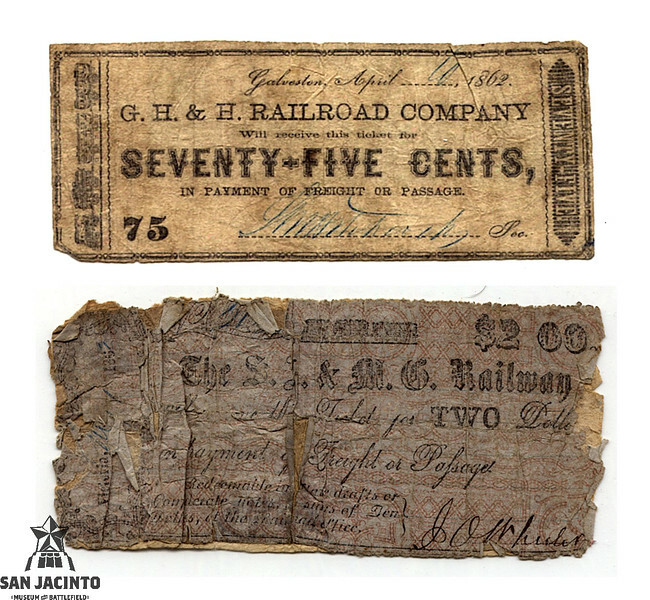 The Civil War was hard on railroads, with some, like the Galveston, Houston, and Henderson, and the San Antonio and Mexican Gulf Railroad issuing their own vouchers when official currency was in short supply. The San Antonio and Mexican Gulf Railroad opened in 1858, running from Port Lavaca toward San Antonio. The tracks were destroyed by General John B. Magruder during the war. The San Antonio and Mexican Gulf merged with the Indianola Railroad Company in 1871. Owned in part by steamship magnate Charles Morgan who acquired wharves in Indianola, the route transported passengers and freight by stage from San Antonio to Cuero, rail from Cuero to Indianola, and steamship from Indianola to Galveston and New Orleans. The hurricanes of 1875 and 1886 destroyed the Indianola wharves and the rail line near the coast, and the company moved its terminus to Port Lavaca. In 1905 the line merged into the Galveston, Harrisburg and San Antonio, and eventually became part of Southern Pacific. 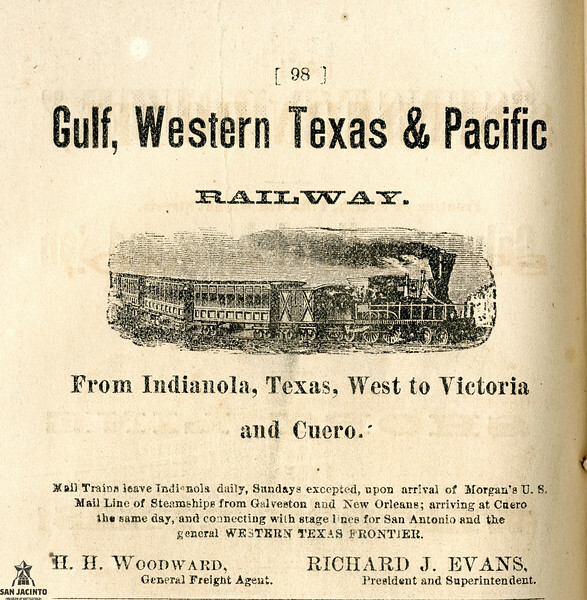 T, W, House and Paul Bremond broke ground for the Galveston and Red River Railway Company in 1853, initially connecting Houston and Cypress. 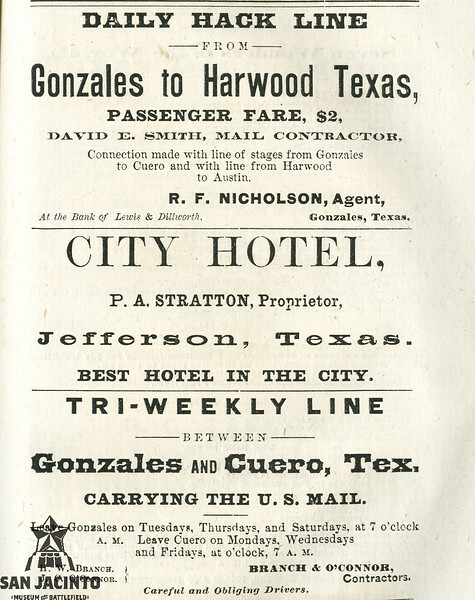 The line was renamed the Houston & Texas Central in 1856. After the war, the H&TC continued to build to both the west and north, reaching Austin in 1871 and the Red River in 1873. 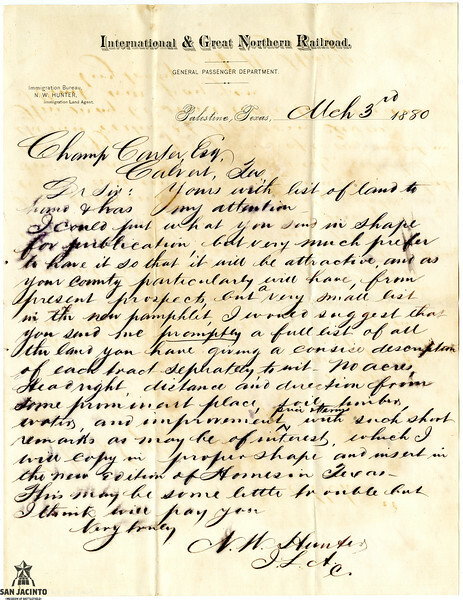 Although trains were supposed to stop only at designated stations, sometimes a special stop could be arranged, as described in this letter. 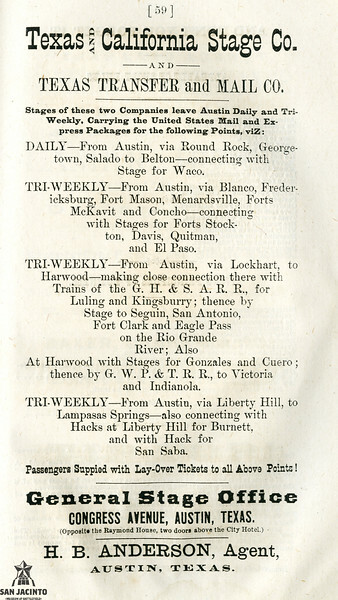 When the H&TC reached Denison in 1873, Texas railroads were connected to the nationwide rail grid through the Missouri, Kansas and Texas Railway. The Missouri-Kansas-Texas Railroad had its start when the Union Pacific Railway Company, Southern Division, was chartered to build a route from Fort Riley, Kansas, to the state's southern boundary, The company soon expanded its plan when granted a right-of-way through Indian Territory, now Oklahoma. 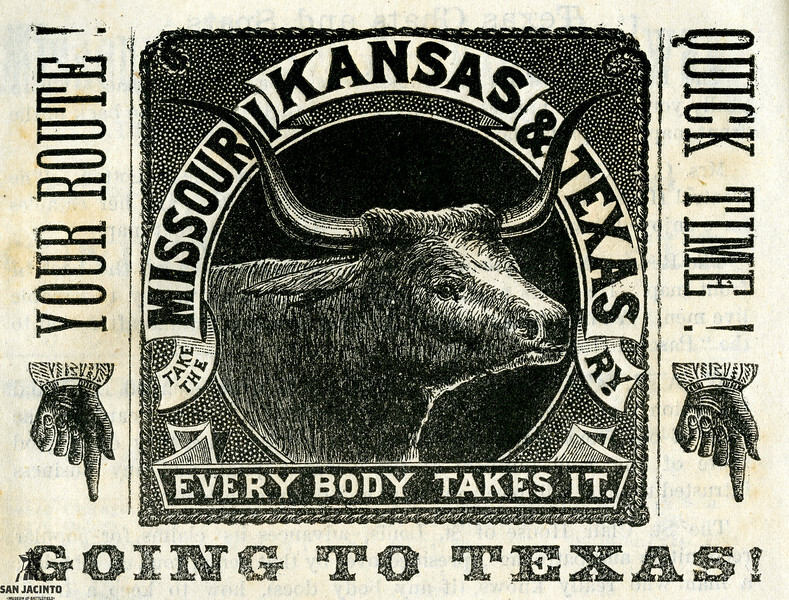 The Missouri-Kansas-Texas Railroad was nicknamed the MKT, KT or Katy. Through merger and construction, the Katy grew from 638 miles in 1882 to 849 miles in 1890. In 1895, the company reported passenger earnings of $1,200,000 and freight earnings of $3,000,000. This description of Texas lands open for settlers appeared below the Missouri, Kansas & Texas 'Going to Texas' ad. It promoted land along the MKT line, because settlers would probably use the proximate line to ship and receive goods, and for passenger travel. 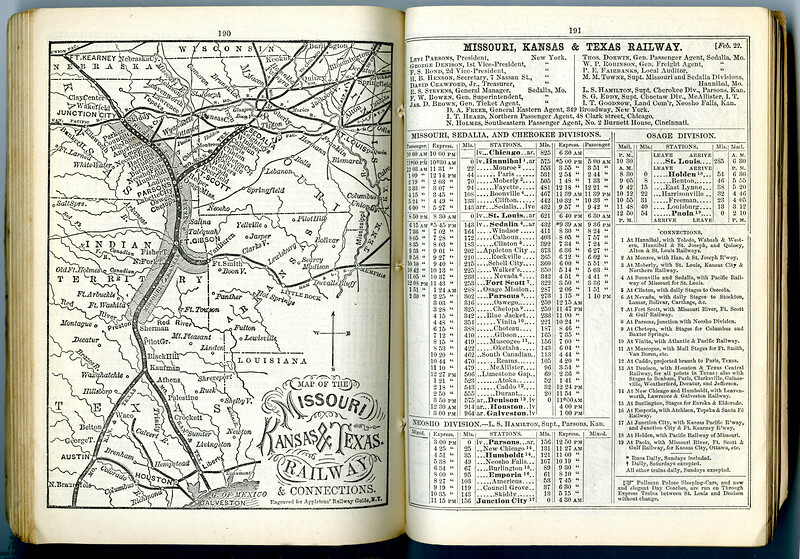 This map, inserted in Bryant's Railroad Guide, shows the extent of Texas railroads in 1875. Note the promotion of Texas lands to emigrants. 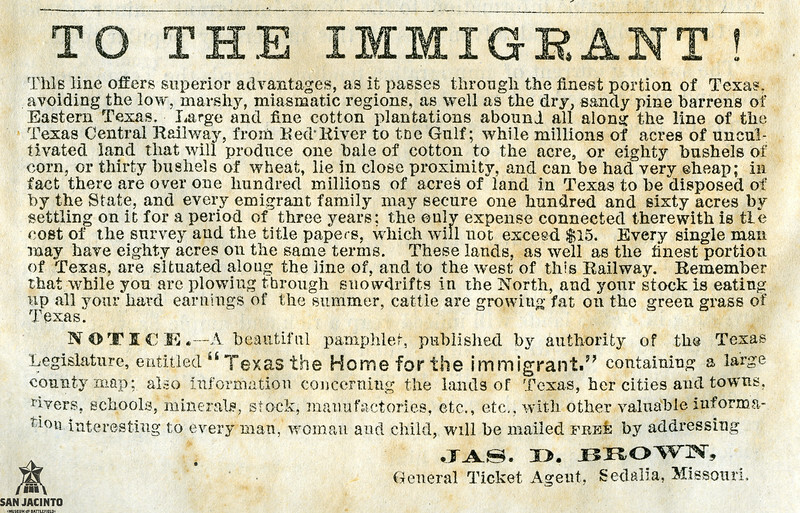 Texas encouraged railroads to provide immigrant rates to settlers, such as a provision in the Gulf, Western Texas & Pacific Railroad's charter that immigrants only be charged 2 1/2 cents a mile. 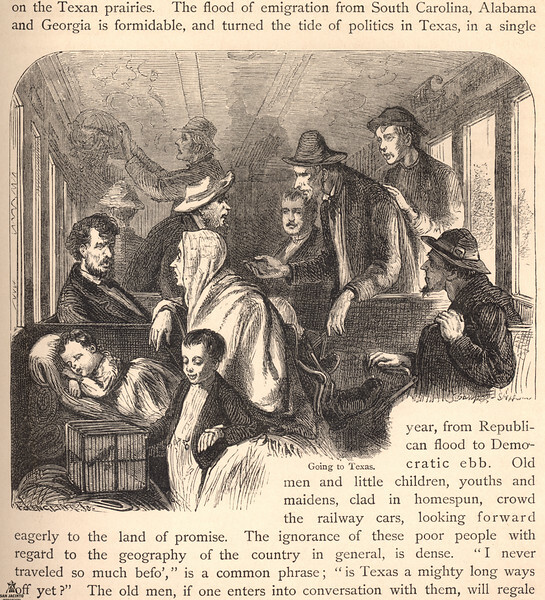 While immigrant fares were inexpensive, the rail cars were crowded and uncomfortable, with hard seats. 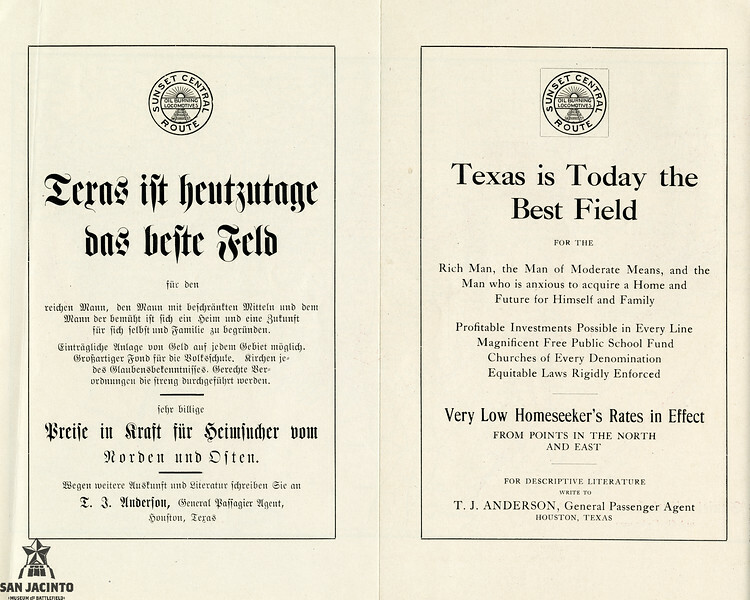 From "Süd und Südwest Texas : South and Southwest Texas, von Orange und Port Arthur am Sabine Fluss bis El Paso am Rio Grando", published in 1910 by the Galveston, Harrisburg, & San Antonio Railway, to encourage emigration from Germany to Texas. 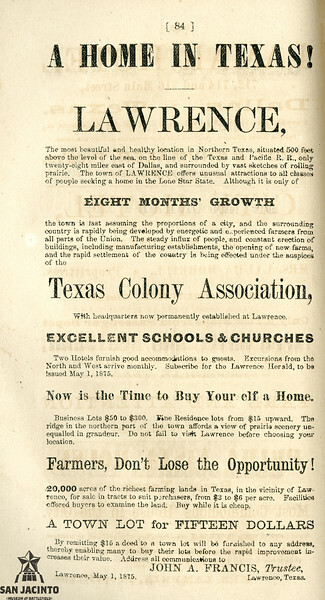 Advertisements like this one for the town of Lawrence, located near the tracks of the Texas & Pacific Railroad, pointed out the amenities of a new town to immigrants, particularly the proximity to a railroad. This is a sample of Union Pacific Railroad Wire, used to keep livestock off of UP's tracks. 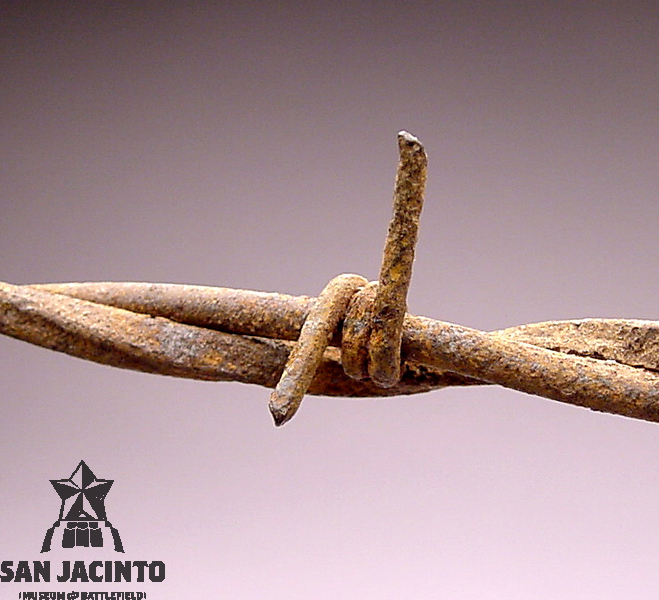 First developed in the 1860s, and more readily available beginning in the 1870s, barbed wire fencing was inexpensive compared to wooden or stone fencing, in part due to the cost of shipping the fencing materials. 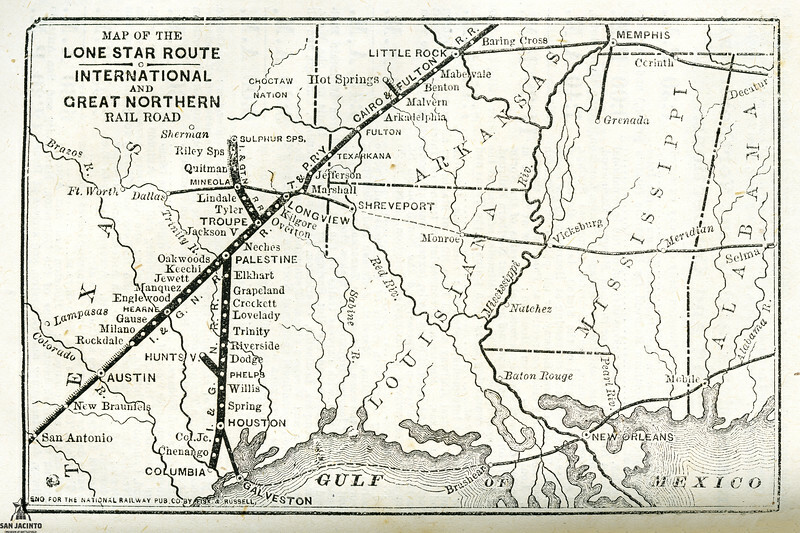 The International and Great Northern Railroad was formed when the Houston and Great Northern Railroad, running from Houston to Palestine, merged with the International Railroad Company, running from Hearne to Longview, in 1873. 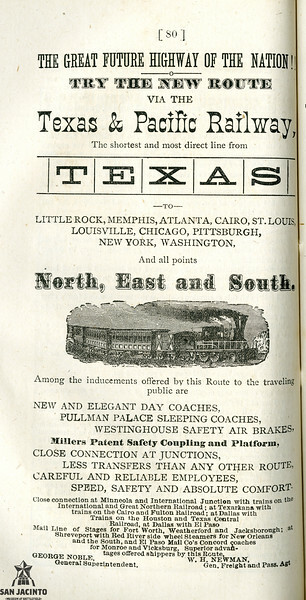 The new company completed its line to Austin in 1876. With connections to other railroads, the International & Great Northern provided an alternative to the MKT. 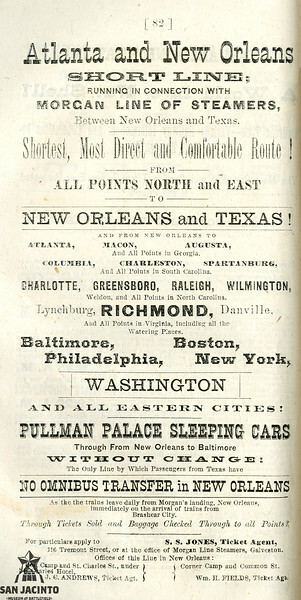 To encourage passengers to select its route, the I&GN touted its shorter distance, and more comfortable Pullman cars. 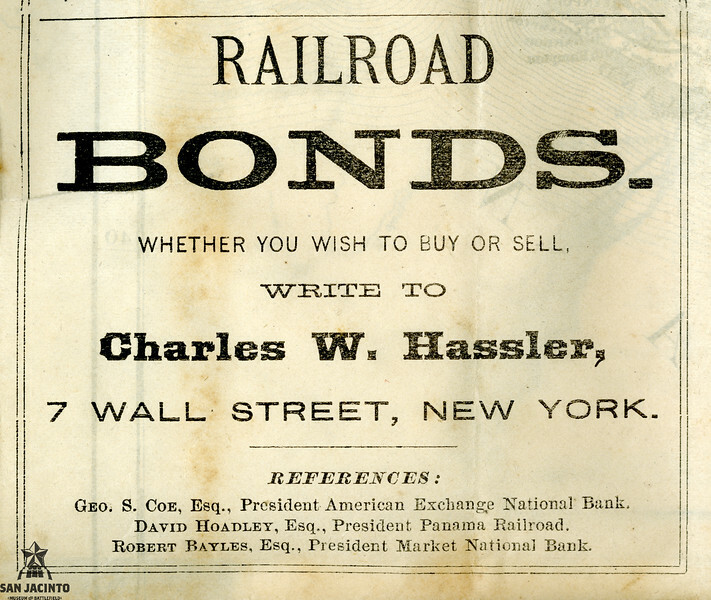 Capital was needed in order to build railroads, and many eastern investors were initially unwilling to risk their funds in the relatively new state of Texas - recall the failure of the Harrisburg and Brazos Rail Road. 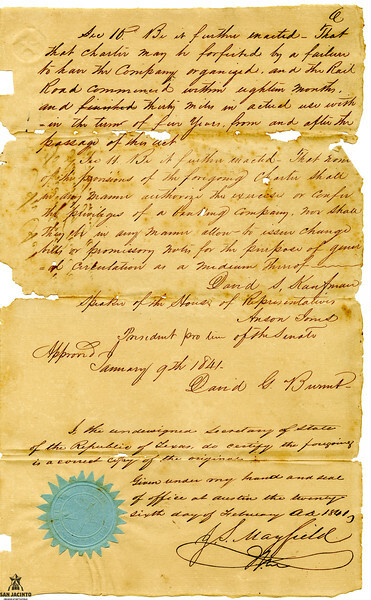 One way the state encouraged the building of railroads was to grant land as a part of a railroad charter; the railroad would then sell the land to raise capital. This letter from the International and Great Northern Railroad concerns listing land for sale. As farming and industry continued to grow, investment in Texas railroads became more attractive to financiers. 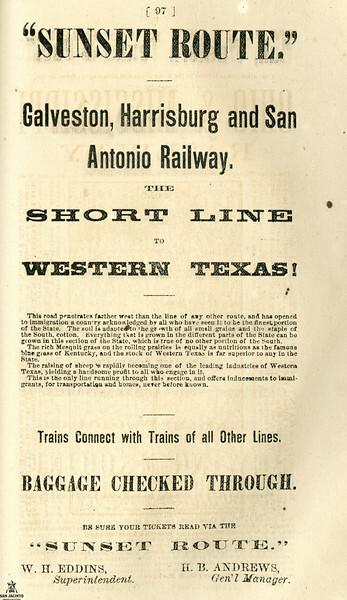 In the 1880s, many of Texas' independent lines began to be purchased by larger rail systems, who also expanded routes. 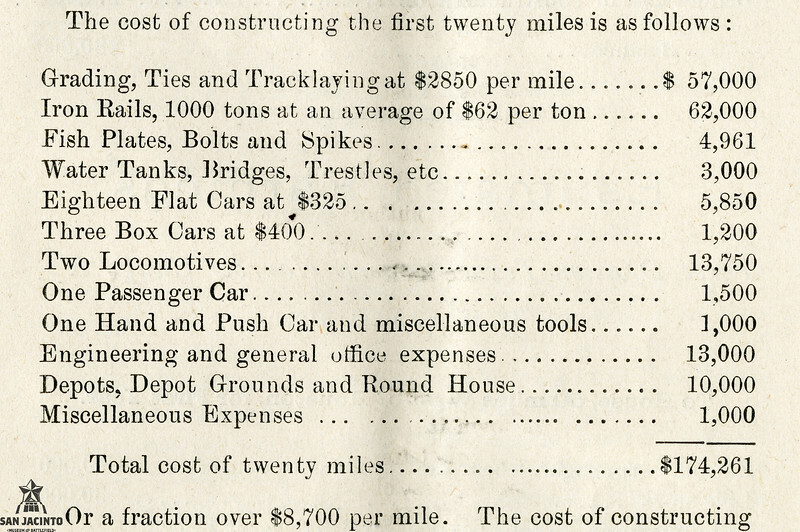 Although the return on investment could be large, the upfront costs to construct and outfit a railroad were not low; in 2014 dollars, the cost as listed in this 1876 prospectus would be $3,818,110 for twenty miles. Track gauge is measured between the inner faces of the rails. Narrow gauge railways are able to take curves at a tighter radius, which is useful in mountainous areas, and the narrower road beds are less expensive to build. Interoperability is a significant advantage, however, and today, 60 percent of the world's railways are built with a gauge of 4 ft 8 1/2 in. The Western Narrow Gauge Railway was the first narrow gauge railway chartered in Texas. As the Texas Western Narrow Gauge Railway, it opened service between Houston and Pattison in 1877. Expanding to Sealy in 1882, the company's cars were not able to connect with the Gulf, Colorado and Santa Fe, due to the difference in track gauge; goods shipped would have to be transferred to different freight cars, which added to the expense and time to ship goods. The company suffered from financial difficulties until the railroad ceased to operate in the 1890s. 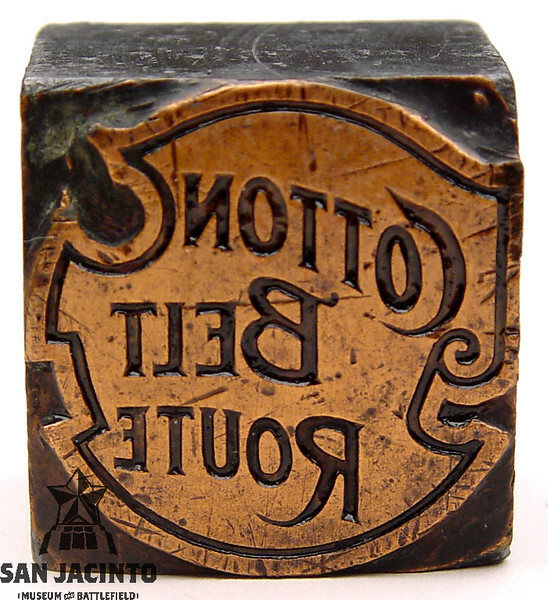 The Gulf, Colorado and Santa Fe Railway Company was chartered in 1873 to build a line from Galveston through central Texas to Santa Fe, New Mexico, to connect with the Denver and Rio Grande Railroad. George Sealy reorganized the company in 1879, and in the 1880s the company opened several branch lines. In 1886 the Gulf, Colorado & Santa Fe became a subsidiary of the Atchison, Topeka and Santa Fe Railroad Company, which had recently completed a route to the Pacific. 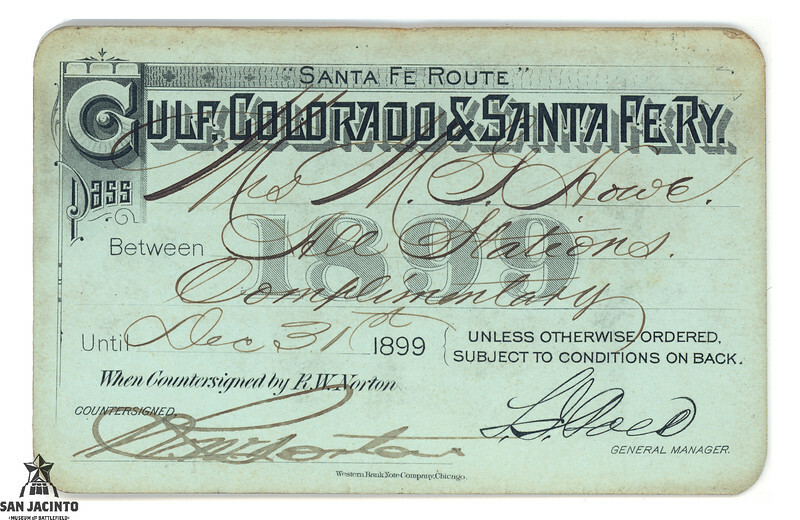 The GC&SF continued to operate under its own name, earning $1,125,000 from passenger revenue in 1892. The two companies merged in 1965. 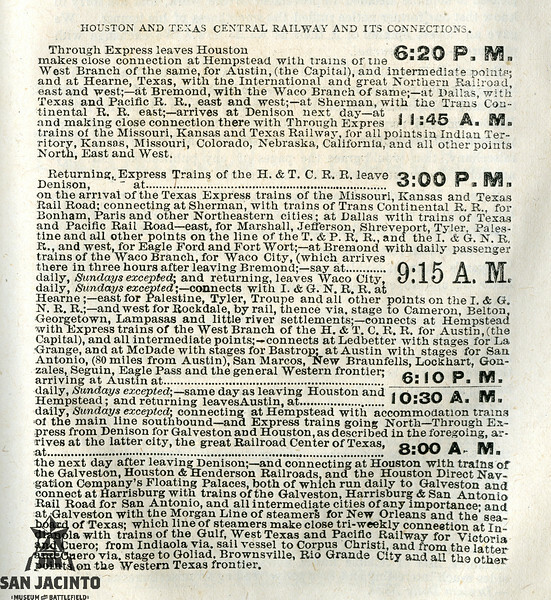 The idea of a transcontinental railroad through Texas was of such interest to Texans in 1853 that a newspaper printed this extra broadside reporting on a railroad bill in Austin. The bill, however, did not pass. 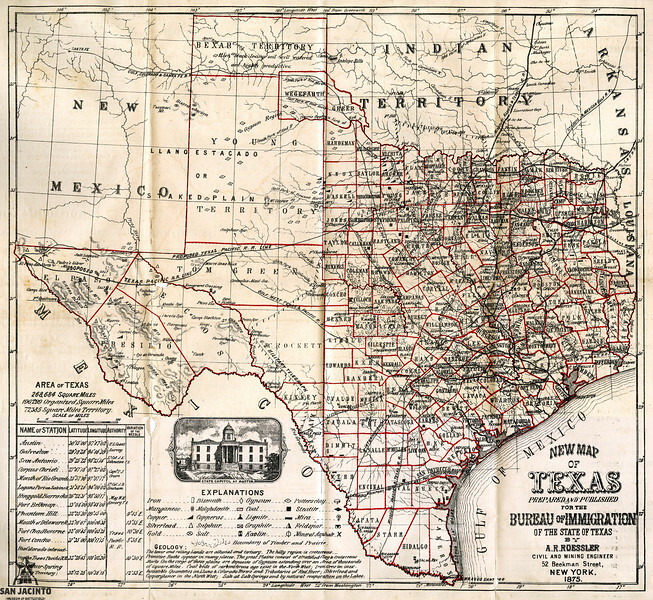 The first transcontinental railroad, however, did not traverse Texas. 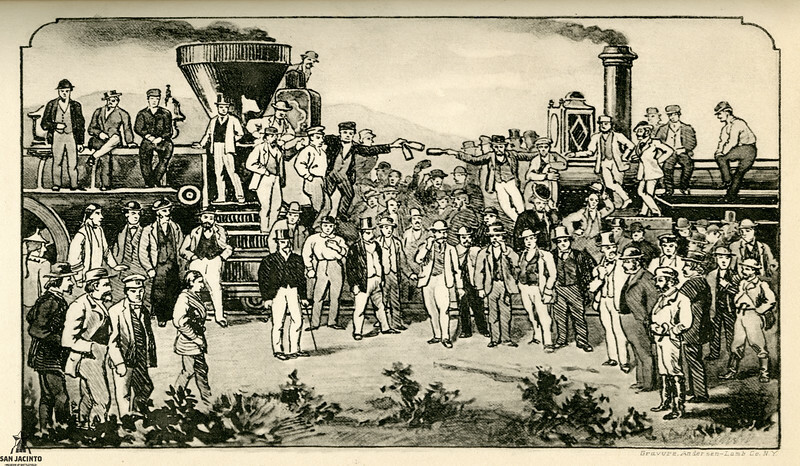 The locomotives Jupiter, of the Central Pacific, and 119, of the Union Pacific, met on May 10, 1869, at Promontory Point, Utah, when the last spike was driven. Between 1881 and 1885, the Texas and Pacific was leased to the Missouri Pacific Railway, both being under the control of Jay Gould. Beginning in 1918, the Missouri Pacific began purchasing Texas and Pacific stock, owning 97 percent of the company by 1974. Many Texans in the 1880s felt they were overcharged by monopolistic railroads that had too much political influence. Elected Texas Attorney General in 1886, James S. Hogg enforced laws that required railroad companies operating in Texas to have an office within the state, ended pooling which set rates and divided traffic among he larger rails systems, and won a legal battle against the powerful Jay Gould's railroad interests. 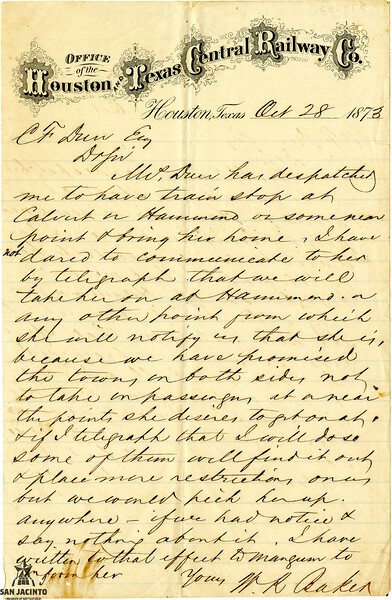 Recognizing that the attorney general's staff was too small to effectively enforce Texas' laws concerning railroads, Hogg proposed the formation of the Railroad Commission of Texas. 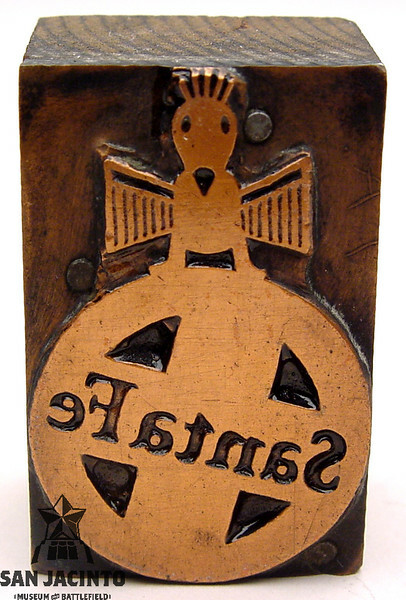 The St. Louis Southwestern Railroad ran from St. Louis and Memphis to Dallas, Ft. Worth, and Gatesville, Texas. By Texas law, the portion in Texas operated separately, as the St. Louis Southwestern Railway Company of Texas, beginning in 1891, operating out of Tyler. By 1915, the system owned 803 miles of main track in Texas, connecting Texarkana, Gatesville, Sherman Hillsboro, Sherman, Tyler, Fort Worth, Lufkin, Stephenville, Cpomanche, and Edson. The Cotton Belt eventually was consolidated with Southern Pacific. 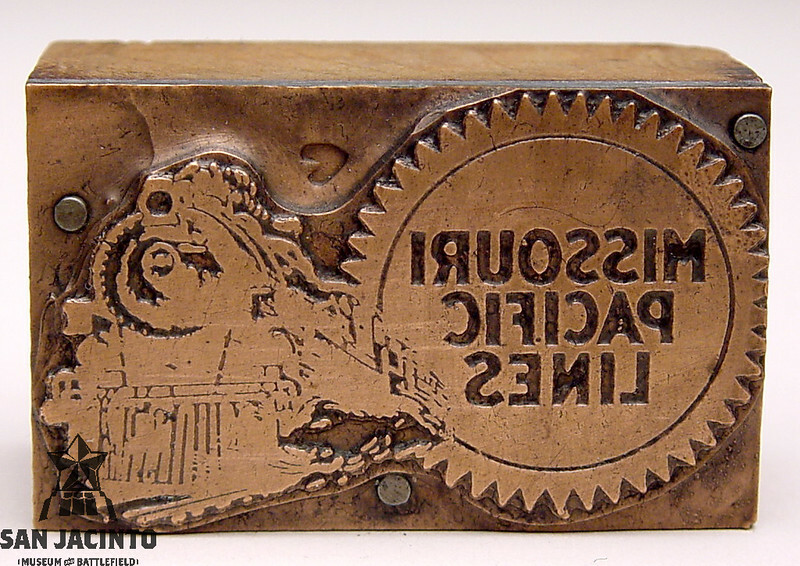 The Southern Pacific Company was formed in 1865 in California. In January of 1883, the second transcontinental railway was completed when the Southern Pacific tracks from Los Angeles met the Galveston, Harrisburg and San Antonio Railway near Langry, Texas. Unilke the earlier Union Pacific/Central Pacific line, this route could remain open all year around. 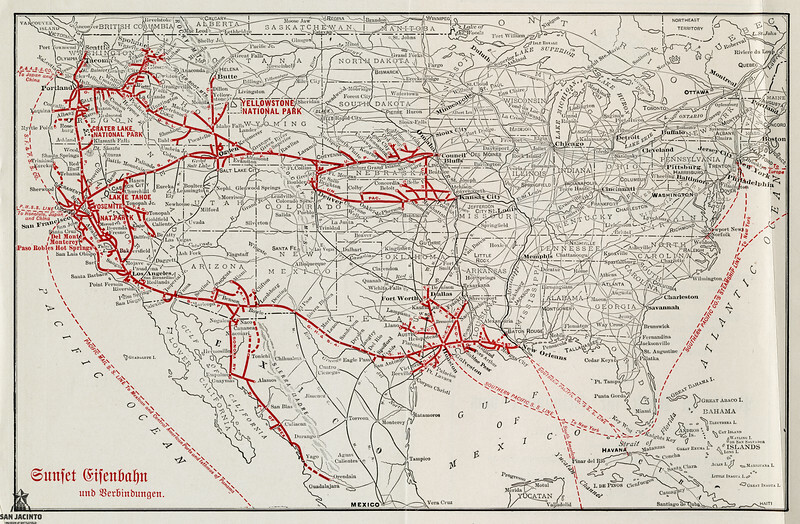 The Southern Pacific connected California to New Orleans and points east. This map of the Southern Pacific's Sunset Line and associated railways includes some of the steamship routes also operated by Southern Pacific. Acquired through purchase of Morgan's Louisiana & Texas Railroad & Steamship Company, the ships stopped at ports including New York, Galveston, New Orleans, Key West, Havana, San Francisco, Honolulu, Yokohama, Hong Kong, and Manila. With the growth of railroads, travel to expositions and world's fairs became a possibility for more than the wealthy. The first world's fair held in the U.S., the Centennial Exposition of 1876 in Philadelphia, was visited by over 1o million people, many traveling on special trains from New York, Baltimore, and Pittsburg. 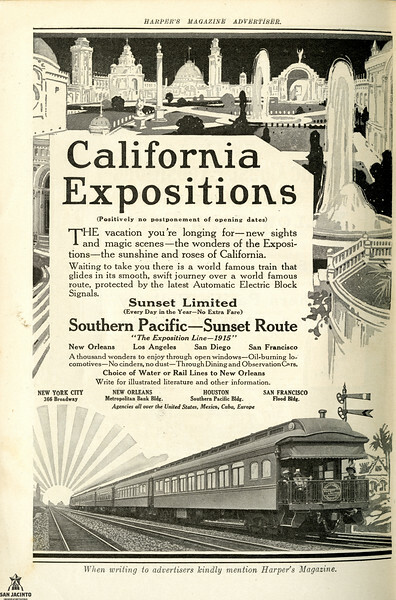 1915 found two competing expositions celebrating the opening of the Panama Canal; the Panama-Pacific International Exposition in San Francisco, with 18.8 million visitors, and the Panama-California Exposition in San Diego, with 3.7 million visitors. Texans could easily visit both on Southern Pacific's Sunset Limited. 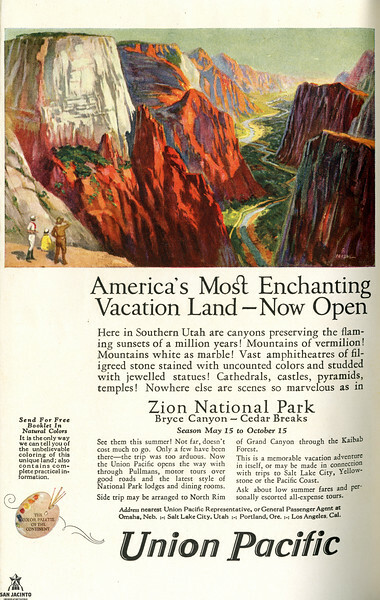 Paintings of Zion Canyon were exhibited at the St. Louis World's Fair in 1904, leading to the creation of Zion National Park in 1919. The first visitor camp was built at Zion in 1917, and was purchased by the Utah Parks Company, a subsidiary of Union Pacific Railroad, in 1923. Ten-day rail/bus trips visited Zion, Bryce Canyon, Kaibab, and the Grand Canyon. 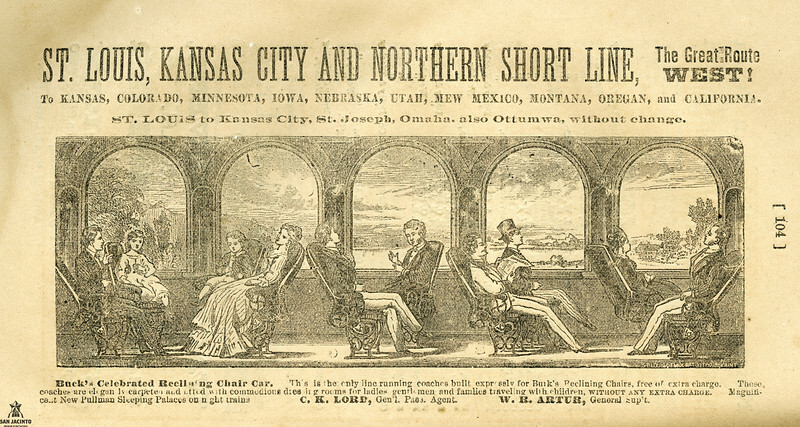 Once travelers had the option of choosing their route and their rail line between two points, passenger comfort became a selling point for railroads in a competitive market. 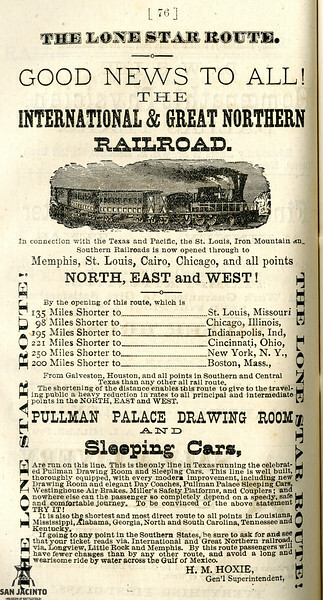 Note that this ad highlights the use of Pullman Palace Sleeping Cars, and the fact that no transfer was needed between stations in New Orleans. This rail line featured Burk's Reclining Chair and dressing rooms for ladies and gentlemen in its advertisements.. 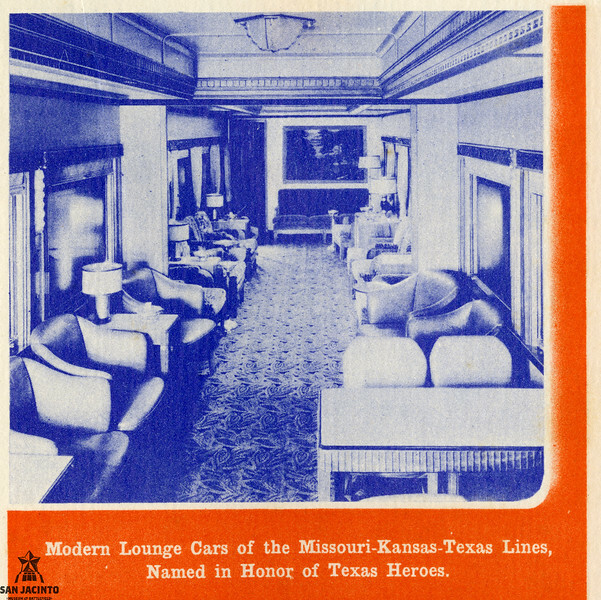 Similarly, this 1936 picture in a Texas Centennial pamphlet published by the MKT promotes the comfort of its passenger cars. Food service was not available on early trains. Travelers would visit a roadhouse or eating house while a train was stopped to add water to its boiler, or would carry food with them. By the mid 1880s, dining cars were standard on most long-distance trains, with the quality of food and service being one way a railroad would compete with its competitors. The exception was the Atchison, Topeka and Santa Fe Railway, with its Harvey Houses providing quality food at water stops. 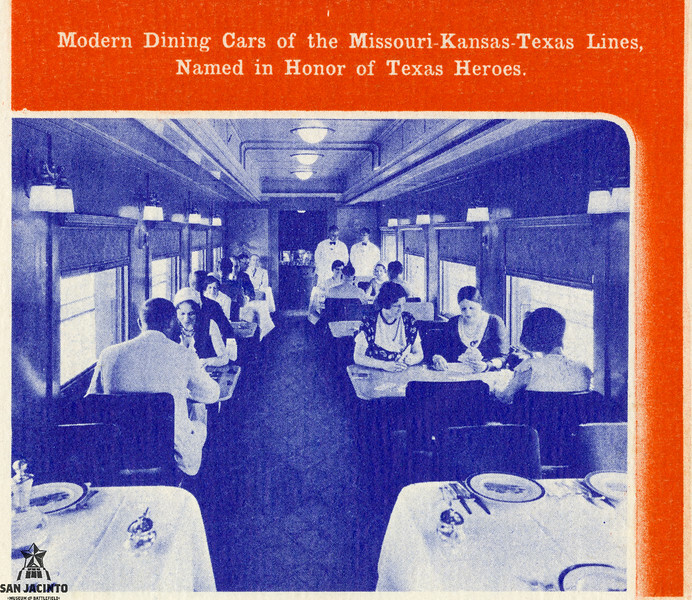 This picture shows the quality of the table settings in a 1936 dining car. A passenger arriving at a Texas station would need to coordinate transportation to a final destination, either by hack - a rented horse - or by stage. The Gulf, Western Texas & Pacific stopped in Cuero, the Galveston, Houston, and San Antonio at Harwood. Stage lines carried U.S. mail as well as passengers, timing the stage's departure on the arrival of mail by rail into a station. Coordinating stage service before or after a train trip might require an overnight stay in a hotel.